Southeast-Asia has its fair share of tourists and travellers who rave about the beachy destinations in Thailand and volcano hopping islands in Indonesia, and great Michelin-star hawker centres in Singapore but Malaysia does not get its fair share of love compared to its neighbouring brethren. While Singapore's hawker food may be inferior to Malaysia - it doesn't matter - because Singapore has managed to market themselves better than Malaysia. The government of Singapore has easily laid out a promotional strategy to tell interesting Singapore stories while making a push to ensure its street hawker food gains UNESCO heritage status. But Malaysia, in the backyard, beyond the Petronas towers and the Batu Caves, remains exclusive unless you know the places through a local. It might be hard to get to, but travellers are known to appreciate the fine adventures of getting to these hidden gems. Imagine if Malaysia had the perfect infrastructure and bus service to make it more welcoming to tourists - even though it sounds great on paper and may be advantageous to the tourism industry, but drawing the crowds while keeping the culture intact will most likely not work out. Here’s a two week itinerary for backpacking or travelling in Malaysia for those who don’t mind being adventurous for a little while. The Petronas Twin Towers remains a top destination for tourists who come to Malaysia. It symbolises the modern Malaysia that has helped put the country on the global stage as an international player. The design combines Malaysian architectural heritage and displays subtle accents of the Islamic culture and is constructed from reinforced concrete with steel and glass façades. It is organised chaos whenever you visit the center of Malaysia’s capital, in downtown KL city. Most tourists often visit the Observation Deck, Skybridge and the infamous gift shop. Ticket sales open at 8.30am and it costs RM80 for adults and RM33 for a child ticket. I would recommend visiting the Petronas Twin Towers instead of the KL tower. Tickets are often sold on a first come first serve basis so you may want to book it on the official website. Alternatively, you could book a KL Tower tour over here. Getting a feel of the city does not always have to be fast-paced, you can slow down and seek it out in an activity that is truly educational and enriching: batik-painting in Malaysia. Batik making is often famous in the East Coast of Malaysia like Kelantan, Terrenganu and Pahang but you can still experience this in the city at Ainna Artwork. Ainna Artwork is nestled at Art Annexxe at Central Market Malaysia. It is fairly inexpensive as for RM20-15 you get to choose your canvas from two sizes and paint to your heart’s content. You can take the LRT or MRT to Pasar Seni to reach Central Market. There are also lots of other tourist attractions in the area including Merdeka Square and Petaling Street (Chinatown). Once you’re done experimenting with different designs, don’t forget to taste one of the best Malaysian biryani at Restoran Tajudin Nasi Beriani. It is a short walk from Central Market and has one of the best flavours combining a rich spicy gravy, fried chicken, cucumbers and your choice of vegetables. Known as the green lungs of the city, the Lake Gardens or Taman Tasik Perdana is a vast park smacked right in the city centre. It is often my go-to place for running or walking around the man-made lake and up to the hibiscus garden. The best time to visit the Lake Gardens is in the evening at around 6.00pm. Don’t make that mistake of coming early because the sun rays can be potent in the morning and afternoon. There are plenty of things and monuments to see around the park like the Bird Park. Butterfly Park and Deer Garden. Even the National Museum and National Mosque is within walking distance. If you have more time with you, I’ll recommend a half-day tour or a KL Hop On and Hop Off Day Pass. The reward of being in Malaysia is getting easy access to a wide range of food options. However, Malaysia’s national dish is the iconic Nasi Lemak which is a rice dish cooked in coconut milk and pandan leaf, with fried anchovies, sambal, peanuts and the best fried chicken. No other place serves the best nasi lemak than ‘Village Park Restaurant’ known for its heart-stopping fried chicken. The best way to reach Village Park is to take the MRT and exit at the TTDI station and hail a Grab Taxi thereafter or simply get a Grab to this place. From Kopitiams (local coffee shops) to Chinese Hawker food or Malaysian Mamak eateries, there are tons of options to choose from. Savour in some Kaya Toast with Kopi (Coffee) or Teh Tarik (Pulled Tea) and chicken chop at the famous Yut Kee Restaurant, or have some good ol’ hawker food like Kuey Teow or Hainanese Chicken Rice at Bangsar’s Sun Huat Kee or Roti Canai and Rojak at Bala’s Banana Leaf or any Nasi Kandar joint. If there’s one thing that binds Malaysians together is their constant need to poke fun at one another using racist jokes, remarks and commentaries. This is done in abundance with flair and hilarity at the Crackhouse Comedy Club, an underground comedy hall that brings in international acts every week. I am frequent visitor and I can assure you their shows never disappoint. The Crackhouse Comedy Club's co-founders, Rizal van Geyzel is very versatile and always knows how to share his honest take of Malaysians and observations of people in South-East Asia. You can purchase the tickets at the door for RM60 or online at RM50. For a low price, you get 2.5 hours of non-stop entertainment and perhaps learn a little thing or two about his impersonations of people in Malaysia. You don’t have to go to Hogwarts to play quidditch. If you’re in a magical mood to try something quirky with an Asian twist, quidditch might just be a cool fun way to end your trip in Kuala Lumpur. The brooms between your legs may be slightly off-putting but this is a game that will let you put away your inhibitions as you throttle away to score points on your broom. The game is led by the Damansara Dementors and new players are always encouraged to join. When the recent news made its rounds that Taiping was touted as one of the top three sustainable destinations in the world, I was pleasantly surprised. Originally a tin mining town and home to the first post office in Malaysia, Taiping was often a forgotten stop where hordes of travellers would make their way to Ipoh or Penang instead. It is also the wettest town in Malaysia due to our year-round tropical climate. This interesting little town holds historic gems such as Taiping’s first railway station, the oldest museum, hundred-year-old rain trees and interesting Kopitiam shops steeped in history. Spending two days in Taiping allows you enough time to enjoy the unhurried pace and take in the little gems of this old, quaint town. One cannot visit Taiping without visiting this iconic park filled with glorious 100-year-old raintree. George L. Peet’s A Journal in the Federal Capital, aptly described Taiping when he visited in 1993 stating that “I know of no more lovely sight in this country than the Taiping gardens when the rays of the early morning sun are shining obliquely through their clumps of bamboo, palms and isolated trees scattered on islands among the expanse of water. One receives in that glorious half hour an experience of light in foliage that is quite unobtainable in England”. The best thing to do is to sit on the bench by the lake and read a book while you spot water amphibians do their thing. 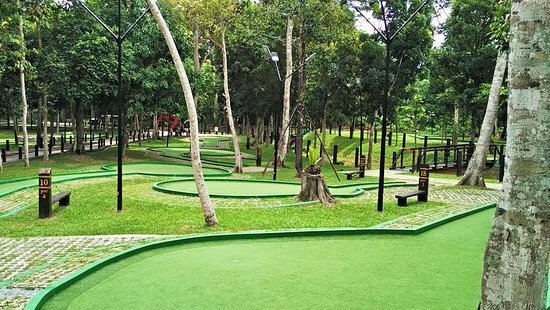 A major draw to Taiping Eco Spritzer Park is its 18-hole mini golf course, where anyone can try playing golf for a small fee. The park is located near the underground water source in Taiping that Spritzer Bhd relies on to produce its bottled water. It’s a nice way to spend a quiet afternoon playing mini golf surrounded with tall and large trees. Time stands still over here as you enjoy a wet plate of Wantan Mee in an old-school Hainanese Kopitiam shop called Yut Sun. Once you’re done you can cool down with cendol in one of Taiping oldest cendol stall, Ansari Cendol. Ansari Cendol’s speciality combines cendol with red bean and pulut beras (glutinous rice), and is priced at RM3. Don’t forget to try the Indian rojak, called Pasembor for RM3 as well. 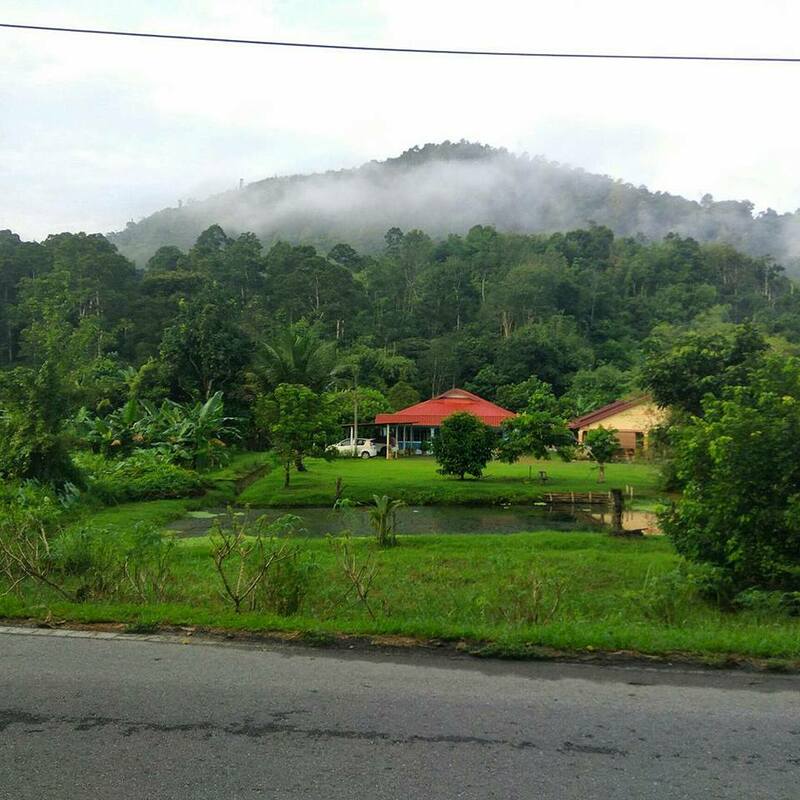 Maxwell Hill, also known as Bukit Larut was founded in 1884 by William Edward Maxwell. It is situated 1,250m above sea level, and known to be as the wettest place in Malaysia. The weather is contrasting and manages to go as low at 15 degrees celsius in the early morning, and drops to a cool 10 degrees at night. Some of the highlights at Maxwell Hill include the Tea Garden House – a former tea plantation office, and the Gunung Hijau Trail. You can rent a jeep or hike up the hill. The Jeep ride will take about 30 minutes and runs hourly from 8am - 3pm (going uphill) and 9am - 4pm (going downhill). Through the Old Town square, there are 7 main pieces capturing the charm and cultural identity of Ipoh created by Lithuanian Street Artist Ernest Zacharevic, who has also created these art installations in Penang. Mural’s Art Lane is one such lane that features multi-cultural Malaysia including slice of life scenes from family to childhood games. The Old Town of Ipoh has been restored and may often seen as an emporium for Chinese culture. The lane may often seem like a small haven for Chinese knock-offs and souvenir items, no where near preserving Ipoh’s identity. One Ipohite has claimed, it has been transformed from "a charming pedestrian-only historical precinct, to a crowded, crass commercial tourist haunt”. If you can close one eye to heritage preservation and have a look at the hidden cafes along these laneways, then a visit to the Concubine Lane should be visited only to see what happens when tourism takes importance over heritage. Gua Tempurung in Gopeng, Perak, is one of the longest and largest limestone cave formations on the peninsula. Most of it has been developed as a show cave with electric lightning and walkways. However, if you take those touristy things aside there are a number of opportunities to experience some real caving exploration. A proper caving experience over here includes crawling, sliding, and shimming as you traverse underground rivers, slippery passages and rock faces, and wading through water. Part of the appeal includes large caverns, beautiful limestone formations and other speleological wonders. I’ll suggest getting your logistics and tickets sorted over here at the Gua Tempurung tour. After a hard day of getting wet and wading through waters, you may want nothing to do with adventure and enjoy a nice cup of coffee instead. It’s nice to savour Ipoh’s famous White Coffee. Ipoh’s White Coffee is a popular coffee drink which originated in Ipoh, Perak, Malaysia, resulting in Ipoh being named one of the top three coffee towns. One such nostalgic place is Lim Ko Pi with a play on the owner’s name ‘Ko Pi’ (coffee). Another place that serves up White Coffee and Wantan Mee is Chang Jiang White Coffee. Where To Stay In Ipoh? One thing great about visiting a tropical country: you can experience the hot and humid weather and quickly seek respite to a cool colonial hill station that was famous during the British era. 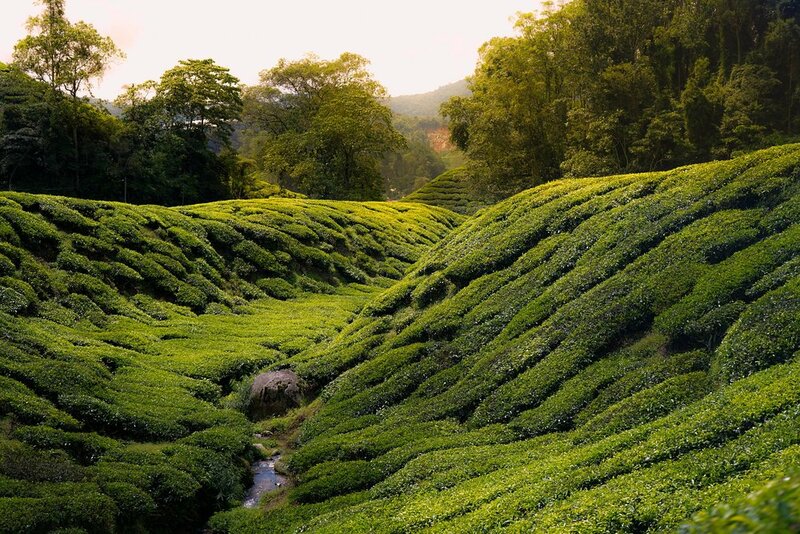 Two hours away from Ipoh, Cameron Highlands remains famous for its sprawling tea plantation. You will see nostalgic reconstructions of English cottages and narrow village lanes dotted across the highlands. BOH Plantation, the largest tea brand in Malaysia has three main farms in Cameron Highlands: Sungai Palas, Habu Ringlet and Fairlie Estate. The new place consists of tea plantations, cafe, gallery, tea and a souvenir shop. It can be slightly touristy and not the best place to visit on weekends, but still worth a visit to take a picture of the surroundings and the fresh, tea leaves. If you really want your logistics sorted and don’t mind a tour, I’d recommend the Cameron Highlands Day Tour. If you want to see the mossy forest in Gunung Brinchang, you need not get a guide. There are 14 well known trails surrounding Tanah Rata perfect for independent hiking. You can easily spend couple of days here hiking to all these trails but some of them are under construction and trail 9 is known for robberies. The short hikes include trail 3, 4, 7 and 10. You can even use the Maps.Me app to navigate in case you’re lost. Where To Stay In Cameron Highlands? Tagged as the “Pearl of the Orient” and the “Foodie Capital of Malaysia”, there’s 1,001 reasons why travellers are always heading off to Penang after Ipoh. It is the place where the hills meets the ocean, where it is easy to hike up to Penang Hill and move on to laidback beach-snoozing activities. Three days in Penang provides ample time to feast on local flavours, hawker food and immerse yourself in the local happenings and festivals. Located at Menara Komtar, if you want to start your Penang adventure, get in a thrilling start by scaling up new heights and going through the world's highest rope course challenge at The Gravityz, all while having a panoramic view of Penang. You can book your tickets over here. 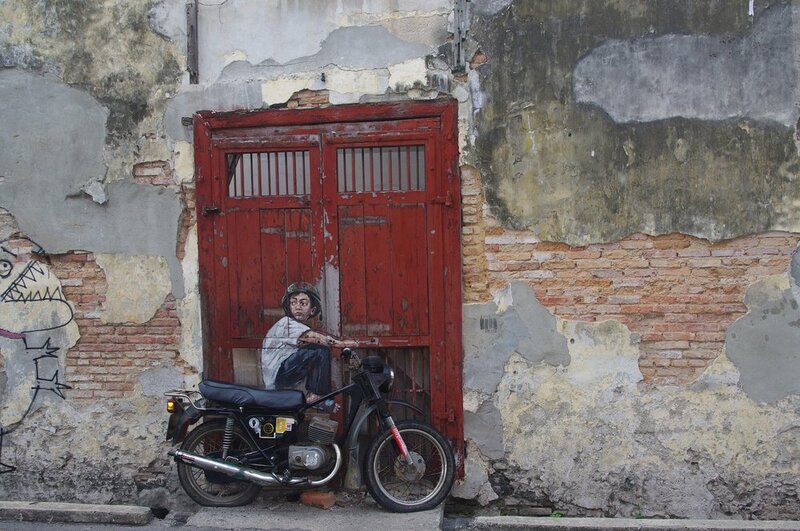 The art scene in Penang has infectiously made its way to the heritage trail of Penang. There’s no shortage of street art, painted walls, sculptures and heritage buildings. It is a nice pleasant walk to immerse yourself in Penang and get a feel of the city. After ending your trip in Penang, head back to Kuala Lumpur for a quick rest before you head out to Malacca for a day trip, a former Dutch colony under the British rule. It is famously known for its Peranakan culture also known as ‘Baba Nyonya’ which refers to as ‘Straits-born Chinese’. The Peranakan culture as a whole is largely defined by its cuisine – Nyonya food. We consider it as one of our major food heritages. It’s obvious that the easiest way to end your trip in Malaysia is to jostle along the Jonker Street and savour one of Malaysia’s prime dessert, Cendol which contains palm sugar, coconut milk and jelly. The strong gula melaka flavour goes well with the coconut milk and jelly proving it as the best dish to cool down from the scorching hot weather. Have it at Christina’s Ee Cendol Shop. To learn more about Peranakan culture, you can head over to the Baba Nyonya Museum. Meander through the home of Baba Chan Cheng Siew (1865-1919) whose eclectic taste offers a glimpse into the richness of the culture and the opulence that was fashionable in many pre-World War II Peranakan homes. The name of the museum is derived from the term Baba, an honorific manner of addressing a Straits-born gentleman and Nyonya which addresses a Straits-born lady. Where To Stay In Malacca? Beyond Kuala Lumpur: Where To Visit Next? Surfing in Cherating: It does not have the best beaches, but just 3 hours away from Malaysia, you can pick up surf lessons that range from RM120 to RM190 in Malaysia’s East Coast. An Alternative Cameron Highlands - Fraser Hill: A colonial era-hill station in Pahang, Malaysia that’s not too far away from Kuala Lumpur. If you’re short on time, this is a great day-trip to escape the crazy city heat with some hiking trails. Hiking in Kuala Lumpur, Malaysia: There are short hikes such as Sungai Chilling or Bukit Tabur which offer a scenic view of Malaysia’s natural terrains. The best way is to go with KL Hiking group over the weekends on the Meet-Up app - it’s free and you meet tons of people. Gourmet Meals In an Organic Farm: A mere 45-minute drive from KL and you can experience a farm-to-table concept by a Malaysian couple in Bentong. The prices are slightly expensive and you would need to book in advance, but I would suggest experiencing this only if you have a special occasion and you wouldn’t mind spending a little more.